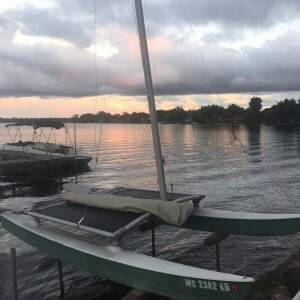 Labor Day weekend didn’t have to mean summer was over, it occurred to me, as I sailed my little 14-foot Hobie catamaran across the middle of Lake Lansing last Sunday evening. September is typically full of very nice, warm weather – even better than June sometimes – and though kids are back to school and people arrange their schedules around football games, I reveled in the confidence there would be plenty of “lake life” to squeeze out before the gales of November came slashin’. Before I knew what didn’t hit me, 22 feet of towering, heavy mast fell over like a dead metal tree, landing partly on the tiny canvas deck of the boat while the rest of it, pulling down 112 square feet of sail with it, splashed into the water behind me. “Houston we have a problem,” as the stranded Apollo astronauts once famously said during a major malfunction. I calmly, even quizzically, stared at the catastrophically collapsed catamaran I was not floating adrift upon. What was once a boat now looked like a mangled raft of wires, canvas, aluminum poles and roping…with me sitting in the middle of it all the junk. It then struck me that had the falling mast struck me I would never have even seen it coming, so I dodged a giant aluminum bullet there. And I hadn’t been tangled in any of the wire lines that came down, nor was I knocked from the boat or struggling to free myself from under the sail, which was now flat on the surface covered with water. The boat was listing but not sinking, and the mast was balanced enough to not slide to the lake bottom. It was at least an hour until sunset, and the water and air were still warm. There were a half-dozen or so pontoon boats and ski boats on various parts of the lake, although none were immediately nearby. I wasn’t hurt or in imminent danger, so I wasn’t ready to endure the embarrassment of yelling out or waving someone down to help tow me and my mess over to the Lansing Sailing Club. No…I just sat there. And you know what, I enjoyed it. For a moment, adrift, I was left with no responsibilities, nothing to do – and nothing I could do…so no place to be but where I was. And where I was…was beautiful: gentle waves, a pink and peach colored twilight sky with streaks of white clouds above an orange sun. Surrendering to the situation was so peaceful. The short-lived, slightly adventurous experience made me wonder how many times on vacations and trips we get so busy running from one sight to the next activity and sharing it all with social media and documenting it all with our cameras that we forget to sit still, look around, and take in the wonder of where we are. The next time you travel try being in the moment. Try purposely being a castaway for while. Michael Patrick Shiels may be contacted at InviteYourself@aol.com His radio talk show can be heard weekday mornings in Lansing on 92.1 FM.